One of my issues with modern architecture is that at street level buildings tend to be very bland. Lots of glass, steel and stone cladding, falling far short of the original architects usual description which frequently seems to include the work “iconic”. Office buildings in the City today are often multi-tenant rather than built for a specific occupier and blandness of the exterior offers no indication of the occupier of the building. Whilst the existence of the majority of companies is obviously to make a profit for their owners, the function within the company that produces these profits often appears to be a sideline for financial manipulation. Buildings that have any external pride or recognition of the business of the occupiers are now rarely seen. This was not always the case, many older buildings in London retain symbols of their past occupiers. A couple of examples I have written about include Imperial Chemicals House on Millbank and the Faraday Building on Queen Victoria Street. Unilever House at Blackfriars is another building that has company related decoration. 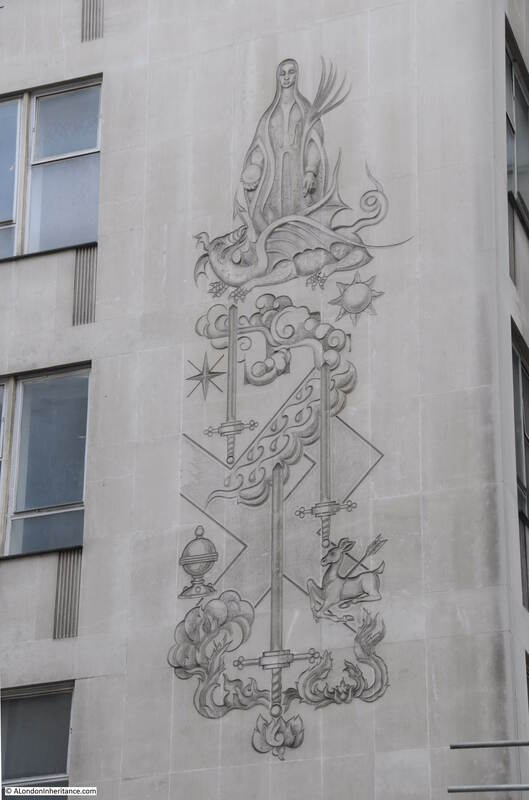 There is another building that has some fascinating decoration, 262 High Holborn has a relief that looks more suited to Glastonbury than adorning an office block in High Holborn. The following photo is of 262 High Holborn, once a property owned by the Pearl Assurance Company. Their main office was the very grand 252 High Holborn, the edge of which is just seen to the right. In contrast to their main building, 262 High Holborn was a very bland and functional office block but look to the far right of the building and an elaborate relief can be seen running up alongside floors 1, 2 and 3. At first glance it looks as if the designer of this relief may have had some substance assisted creativity, but in reality this tells a company history and relationship with London. I have wondered about the detail of the relief every time I have walked past, however a chance find of the book “Pearl Assurance – An Illustrated History” published in 1990 provides a full description of the individual elements of the relief and how they relate to Pearl Assurance. The relief is a representation of the armorial bearings assigned to Pearl Assurance on the 30th November 1911. The following picture from the book shows the armorial bearings in their standard form and it may take a bit of back and forth comparison between the two pictures, but the common elements should be clear. The book includes the following description of the individual elements from information gleaned from an article in the Pearl Magazine of 1950 reporting research by the editor of the time, Len Miller. “The Shield: In general terms the shield refers to the geographical origins of the company and the figure represents Pearl. The Covered Cup is associated with St. Dunstan, the patron saint of the Borough of Stepney, where the company had its first office, in Denmark House, Commercial Road. The Sword represents the City of London (the sword of St. Paul). as does the dragon in the crest above the shield. 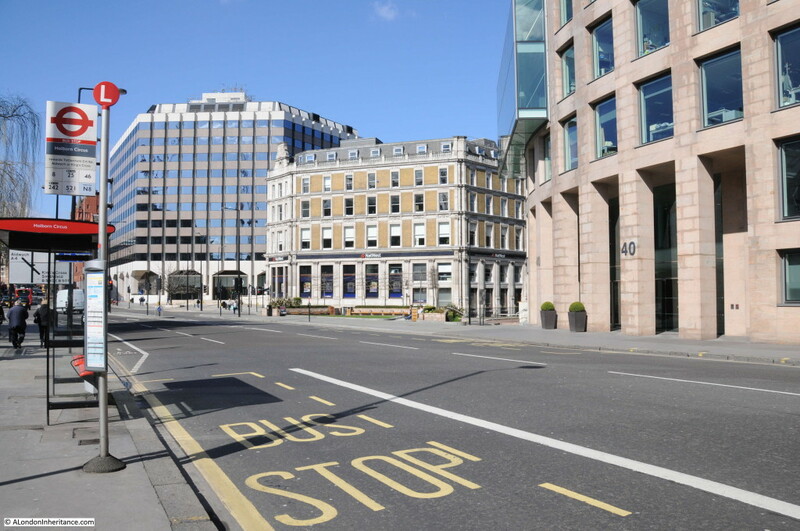 Both refer to the company’s association with the City through Adelaide House, London Bridge. 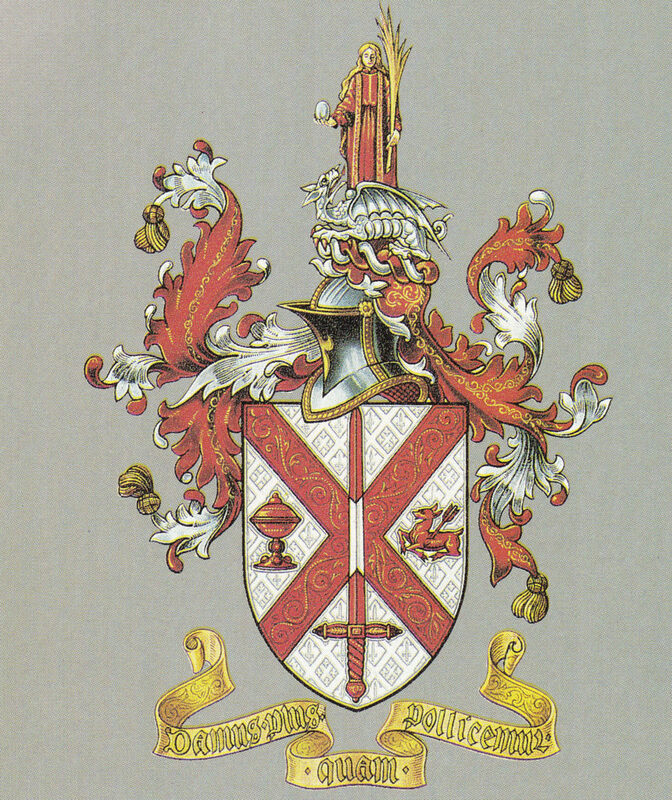 The Wounded Hind and the Red Cross, or Saltire, are taken from the Arms of the Borough of Holborn. Although in 1911 the company’s head office was at London Bridge, the move to Holborn had been planned. The wounded hind refers to St. Giles in the Fields, an allusion to the legend that St. Giles received a crippling injury whilst saving a hind from the huntsman. The cross refers to St. George the Martyr and St. George, Bloomsbury, both churches in what was, in 1911, the Borough of Holborn. The Crest: This consists of a figure representing St Margaret, with a Pearl in her right hand, a palm branch in her left hand and a dragon at her feet. Saint Margaret of Antioch, the Christian daughter of a pagan priest, was imprisoned for her faith and devoured by Satan, in the form of a dragon. With the cross that she wore she possessed the power to burst the dragon open and she emerged unhurt. Margarita (Margaret) is Latin for a pearl, hence a pun links the name of the company with the legend. The palm branch is an emblem of honour and a symbol of success. The motto was not included in the relief on 262 High Holborn, however the rest of the relief is a brilliant interpretation of the armorial bearings of Pearl Assurance and provides a graphical history of the company. The Pearl Life Assurance Loan and Investment Company Limited was formed on the 8th July 1864. It was very much an East London company with all the original directors living within a mile of the Aldgate Pump and the company was registered at the home of one of the directors in Commercial Street. The name Pearl goes back further to 1857 and the Pearl Loan Company, also operating in Commercial Road, with four directors of the company also becoming directors of the 1864 company. Pearl Life Assurance expanded rapidly and moved into offices in City Road, then in 1878 to Adelaide House adjacent to London Bridge. In 1914, the company had outgrown Adelaide House and a new, considerably larger office building was constructed at 252 High Holborn. In the same year the company changed name from Pearl Life Assurance Company Limited to Pearl Assurance Company Limited allowing the company to expand its range of products. Pearl Assurance operated from 252 High Holborn until the 1980s when the company relocated to Peterborough. The old building not being suitable for a financial company transferring over to computerised operations. 252 High Holborn is now the Rosewood Hotel. The building of 262 High Holborn is a bit of a mystery. I have seen references on the Internet to it being of 1950s construction. The website of the architectural practice T.P. 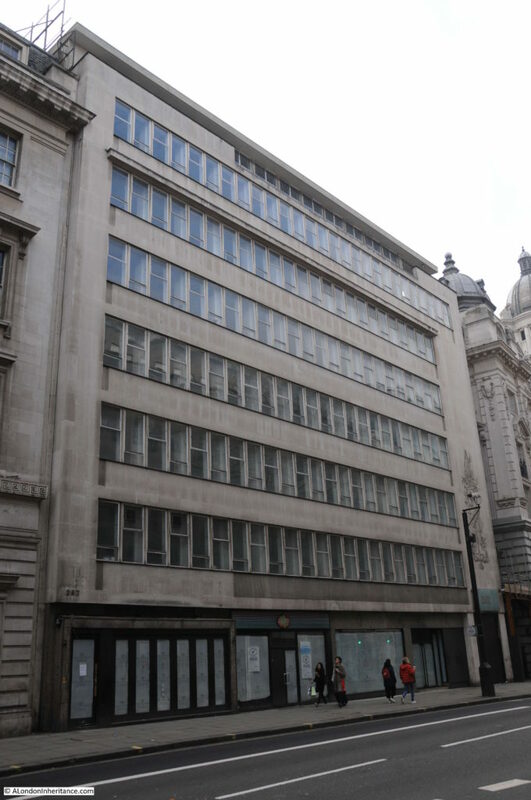 Bennet refers to a period between 1967 and 1979 when the company opened a number of new offices “as well as the main office at 262 High Holborn, designed by the firm for Pearl Assurance”. The style of the relief does look more of this later period. I suspect that despite being adjacent to their head office, Pearl Assurance did not occupy the building. They were investors in property and 262 High Holborn was probably one of their investments. The book “Pearl Assurance – An Illustrated History” seems to confirm this as the book, which covers in detail the growth of the company, buildings occupied, staff facilities etc., makes no reference to 262 High Holborn. It was not to be. This Guardian article from 2004 details the demise of the company. It was later spun off and amalgamated with other assurance companies and funds and the Pearl Assurance name disappeared. The company had a significant amount of archives and there was a Company Archivist. The archives included not only documents and photos covering the history of Pearl Assurance, but also artifacts such as clay pipes from the 17th century found during excavations at 252 High Holborn. I believe that the National Archives now hold a significant part of the Pearl Assurance archives. Today, the relief on 262 High Holborn is the only visible sign in London that I am aware of, of a company that operated in London and was a major employer for well over 100 years – I am pleased that I now understand the meaning behind the details of the relief. This entry was posted in London Buildings and tagged High Holborn, Pearl Assurance on April 30, 2017 by admin. London Under Fire is the title of a set of postcards issued during the last war showing some of the damage caused by bombing around the city. 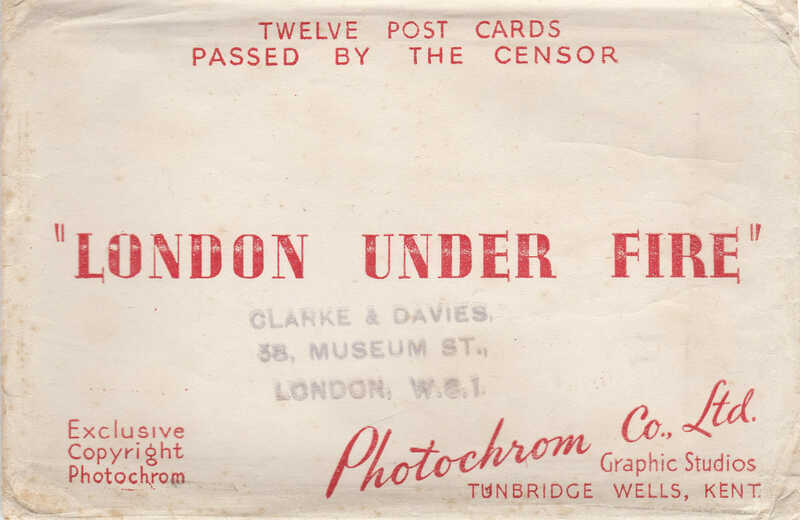 You might think that this was a strange subject for a postcard, and given the levels of censorship at the time, why would photos showing considerable damage to London be published? Although showing how much damage had been caused, these postcards had a very serious message. 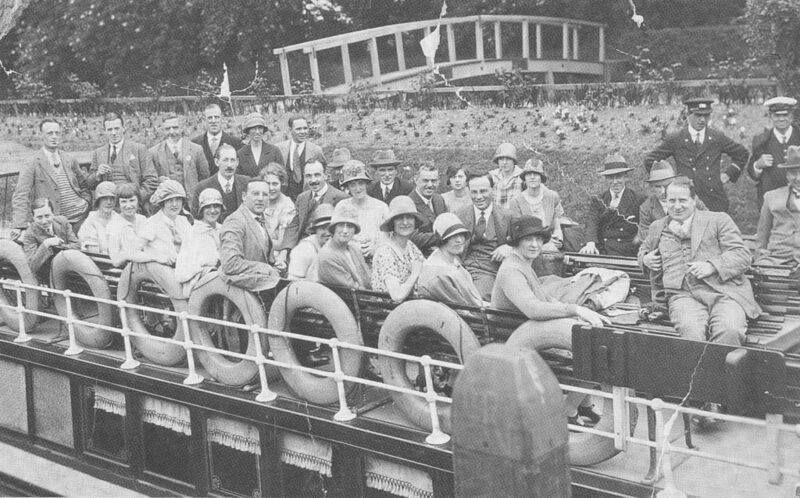 Firstly, the photos were mainly of the City of London, not the main population centres, for example across east London that had suffered so much damage which directly impacted the lives of Londoners. 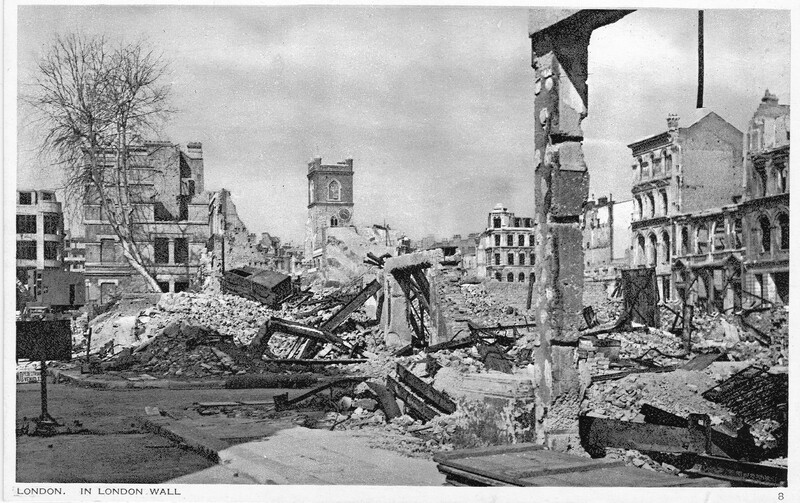 This was after the initial Blitz but before the V1 and V2 weapons fell upon London. The war still had an at the time unknown number of years to run so the message carried by the postcards was very clear, we have taken this much so this is not the time to weaken in any shape or form. As well as an example of one of the many forms of subtle propaganda employed during the war, today they are helpful in understanding how the city has changed so a couple of weeks ago, I took the postcards up to the city for a walk to see what the locations looked like now and how much remained from these original photos. 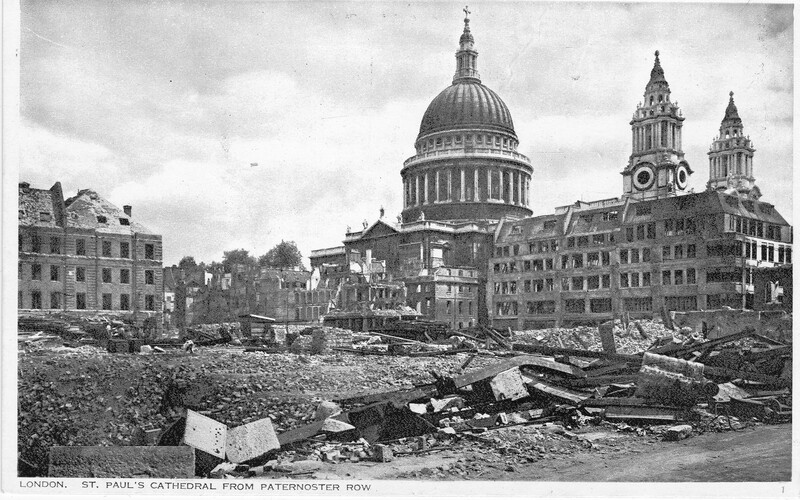 The first postcard is of St. Paul’s Cathedral from Paternoster Row, this whole area across Paternoster Square was destroyed during the attack on the night of the 29th December 1940. 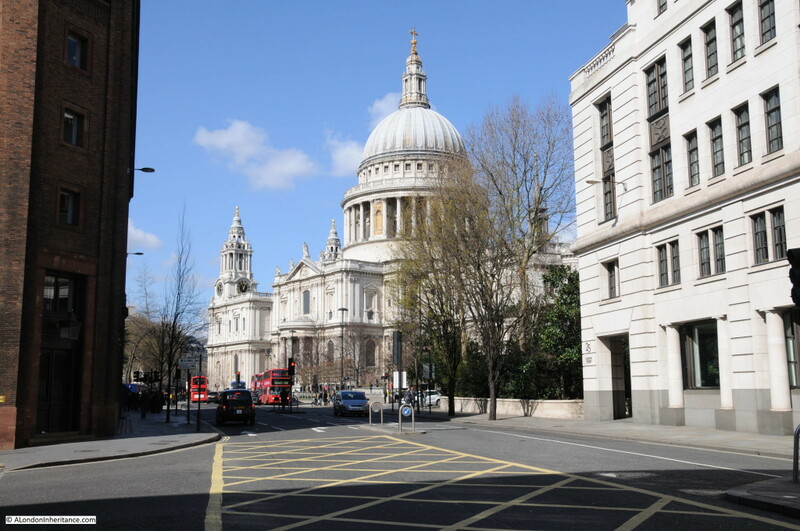 The area today is now covered by the Paternoster Square development, I located the position where I suspect the photo was taken from, but looking across towards St. Paul’s I was looking into an office wall with no sight of the Cathedral. As well as the cathedral, the only building that remains today is the Chapter House. This had been reduced to a shell and is the building in the centre of the photo below the dome of St. Paul’s. The Chapter House was rebuilt and has recently finished a full restoration. 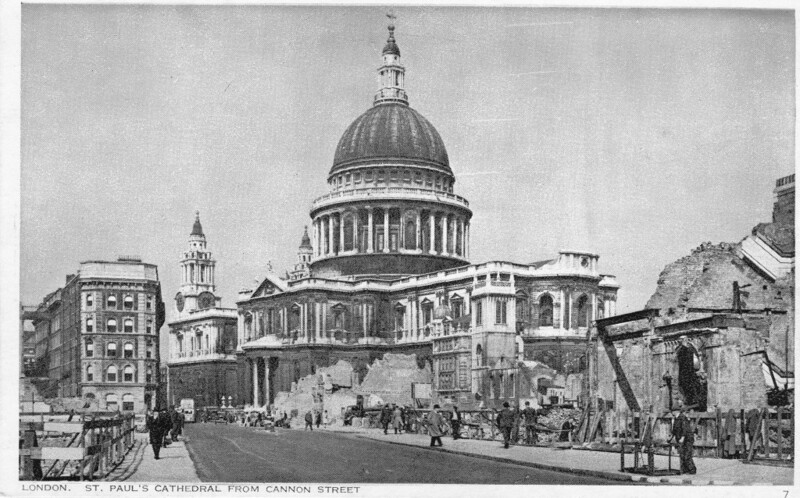 I had better luck with the next postcard, again of St. Paul’s but now from Cannon Street. 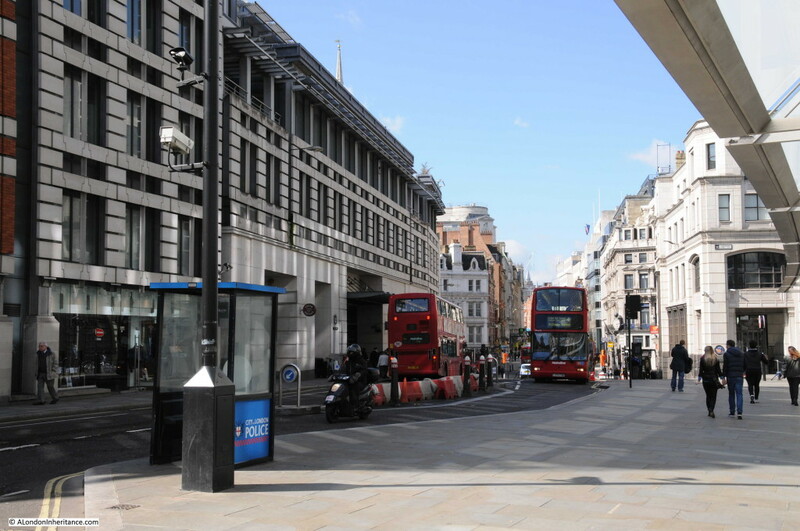 The photo was taken on the corner of Friday Street and Cannon Street. 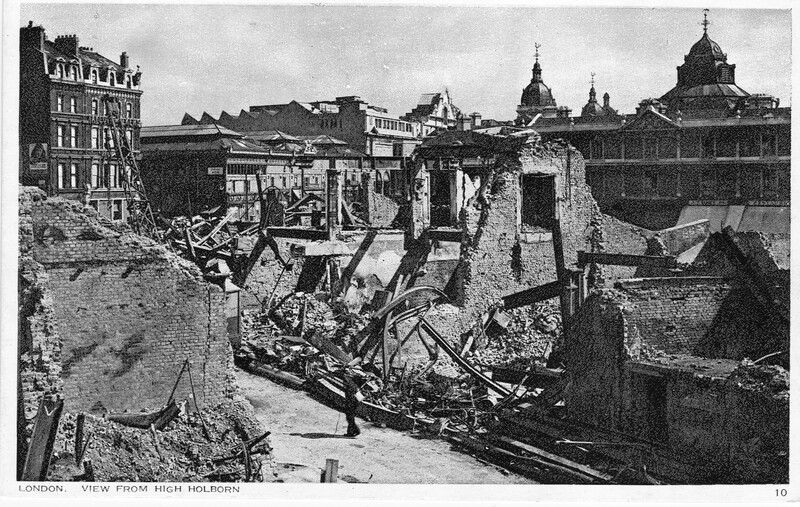 As can be seen in the postcard by the remains of buildings leading up to St. Paul’s along the right hand side of Cannon Street, this view was only possible due to the destruction of these buildings and in the plan for rebuilding the City, the area around the cathedral was opened up making the views we see today possible. The next postcard was taken from London Wall and is looking north across to the church of St. Giles, Cripplegate. 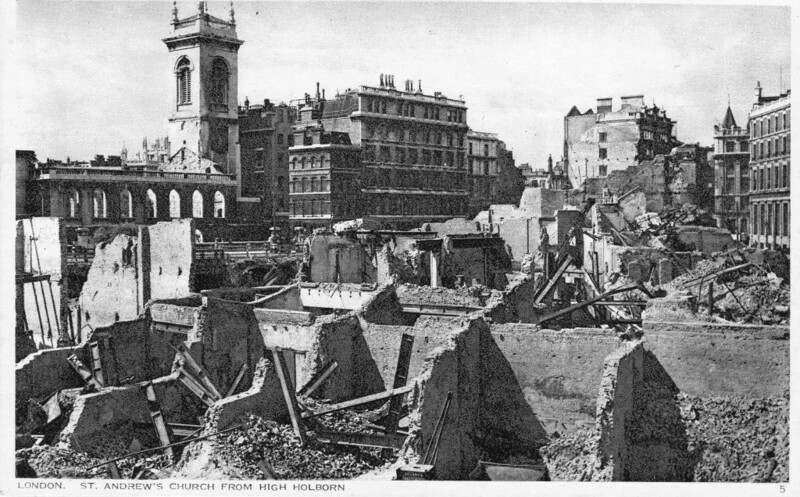 With the amount of building along London Wall, I could not get to the exact position of the original photo, however I did find one position in London Wall where the church tower is visible today. This also shows the Barbican development which would cover so much of this area in the post war redevelopment. 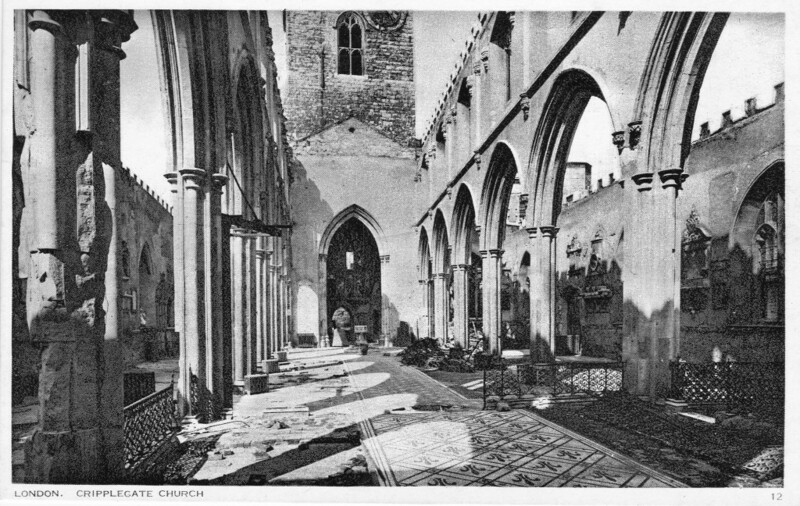 Postcard showing the remains of the interior of St. Giles, Cripplegate. Again, the church suffered this damage mainly on the night of the 29th December 1940. 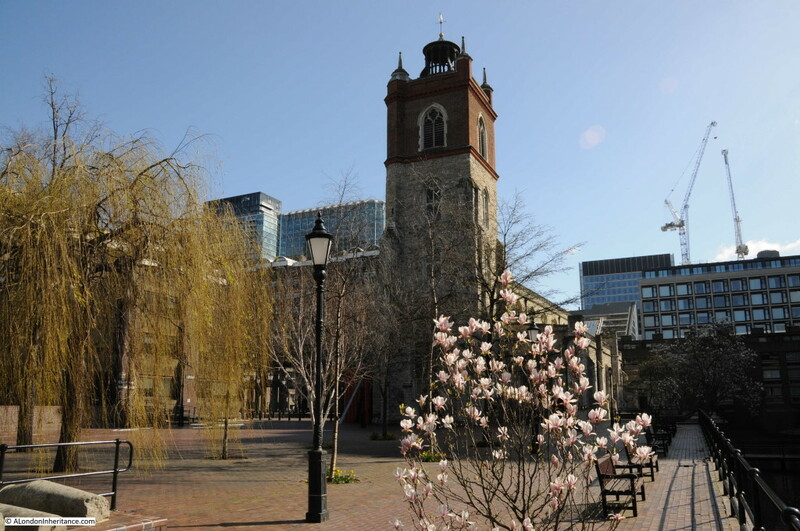 The church was rebuilt after the war, and apart from the remains of the Roman city wall, is all that remains in this area from the pre-war city following the development of the Barbican. The next postcard is showing Fore Street, no idea where in Fore Street as there are no points of reference. But this is Fore Street today. 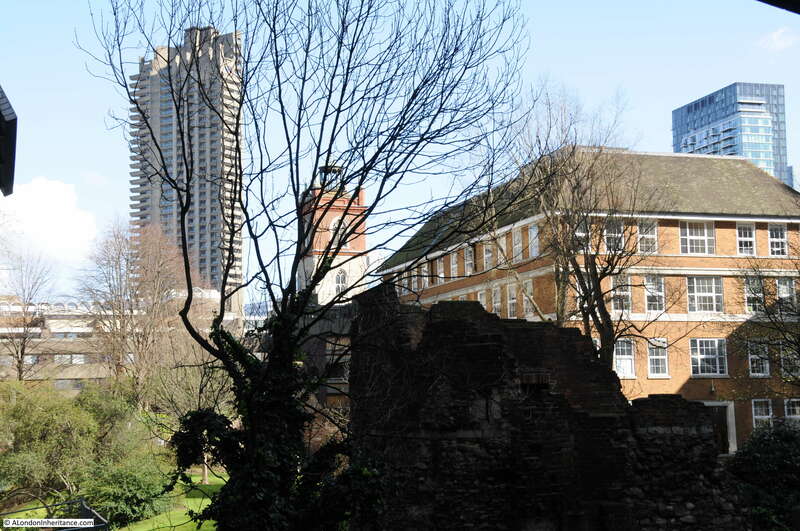 The Barbican is on the left and office buildings between Fore Street and London Wall are on the right. 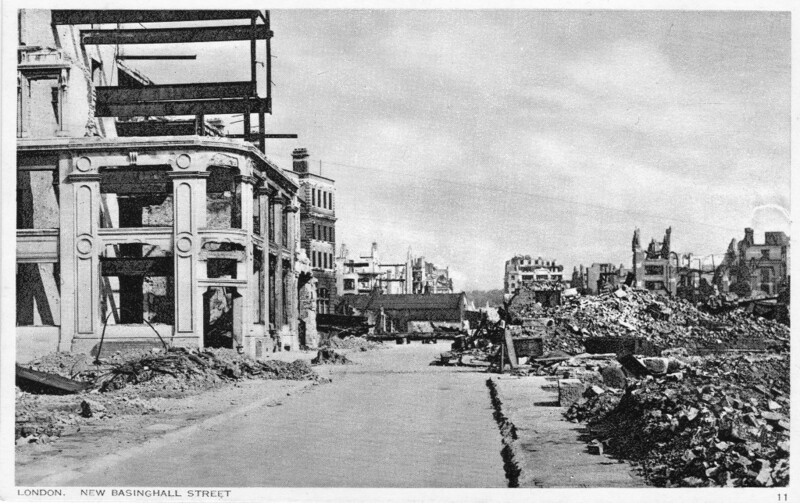 The following postcard is titled New Basinghall Street. I could not find a New Basinghall Street in the City today. 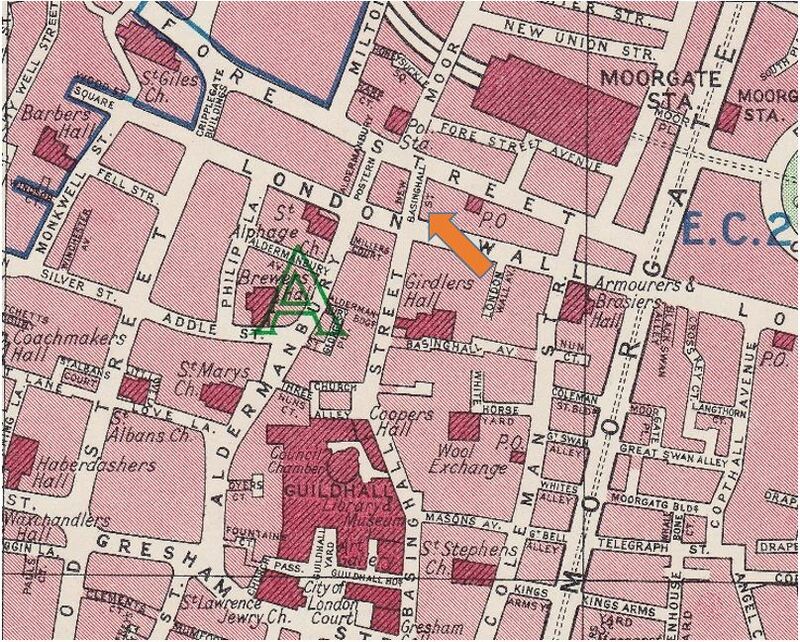 There is a Basinghall Street, but not a “New”, so it was to the 1940 Batholomew’s Reference Atlas of Greater London to check and this is where I found New Basinghall Street, a short extension of Basinghall Street from London Wall to Fore Street. Today, New Basinghall Street does not exist. 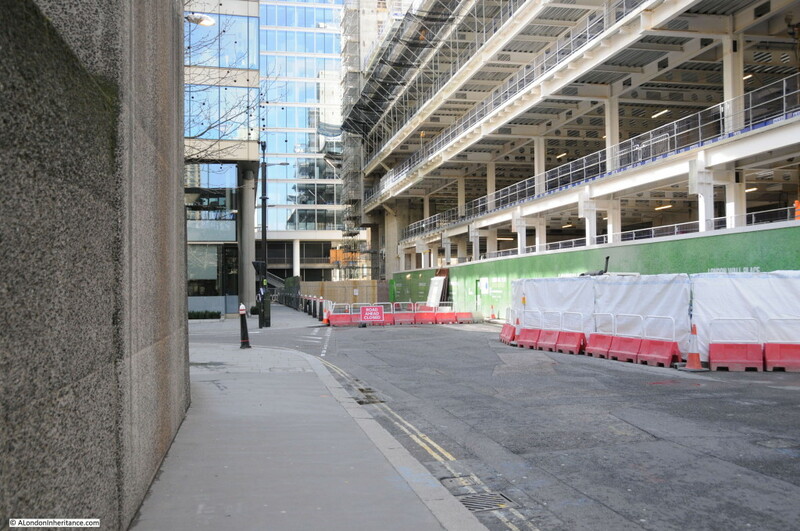 In the photo below of Fore Street today, it was on the right, just past where the road is closed and passed to the right under the new office development to meet up with London Wall. Returning to the postcard of Fore Street, this shows a road leading off to the right and this may have been New Basinghall Street. The next postcard is of the buildings of the General Post Office from Newgate Street. Strange that the postcard does not mention the church in the foreground, only the buildings of the G.P.O in the rear. 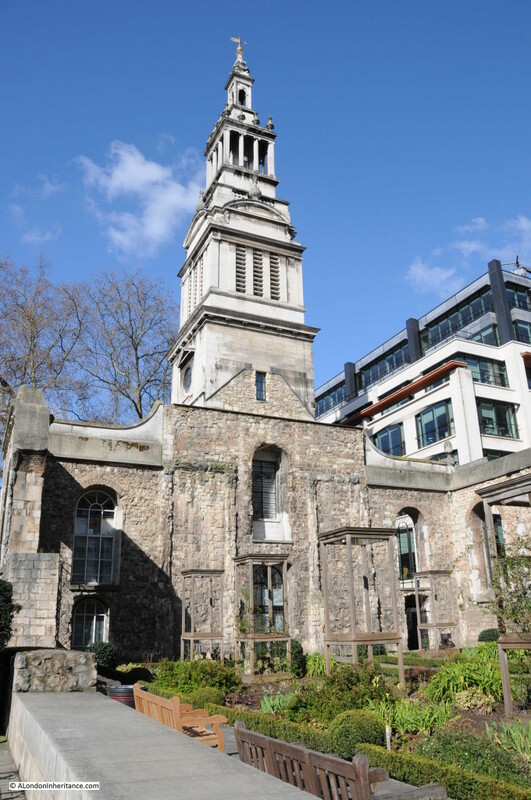 The church is Christ Church, Greyfriars. I could not get the same angle due to new building in the area, so I took the following of the church. 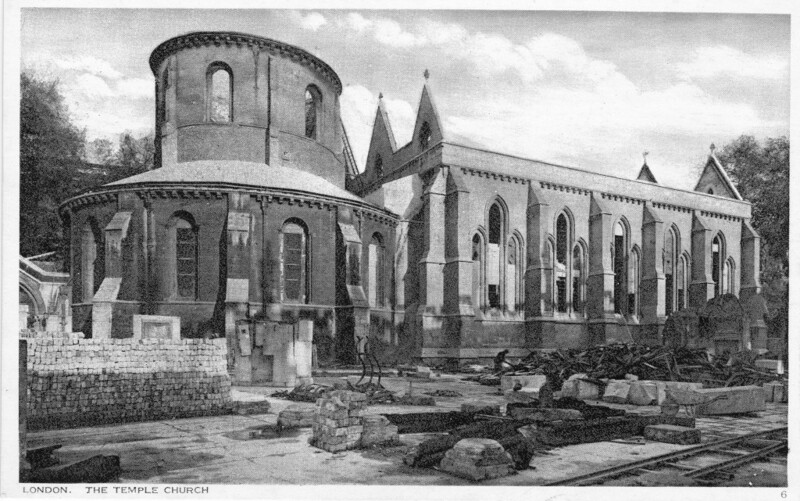 The church was not rebuilt after the war, the tower was preserved and the main body of the old church turned into a garden. One of the few reminders in the area of the damage suffered during the last war. We are now at Ludgate Hill, looking down towards the junction with Fleet Street. The church tower on the left is that of St. Brides. 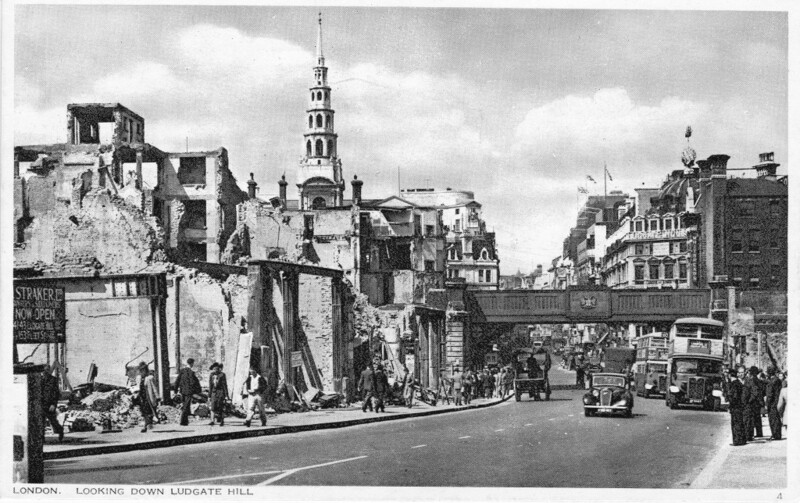 Ludgate Hill today still has the slight bend to the left, however since the photo for the postcard was taken, the railway bridge has been removed and new building on the left has obscured the view of St. Brides with only the very tip of the steeple visible if you find the right place. The buses also look very different as well. Now moving slightly to the west, the following postcard is titled “View from High Holborn”. 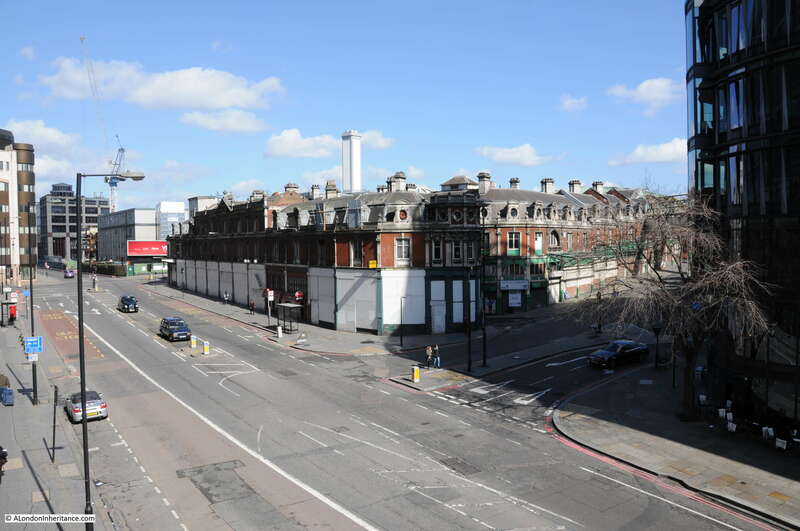 The buildings in the background to the right are those of Smithfield Market. Although I could find the position from where I suspect the photo was taken, the view is totally obscured by new building, so I walked back to where Holborn Viaduct crosses Farringdon Street and took the following photo of the market buildings. And another view of High Holborn. 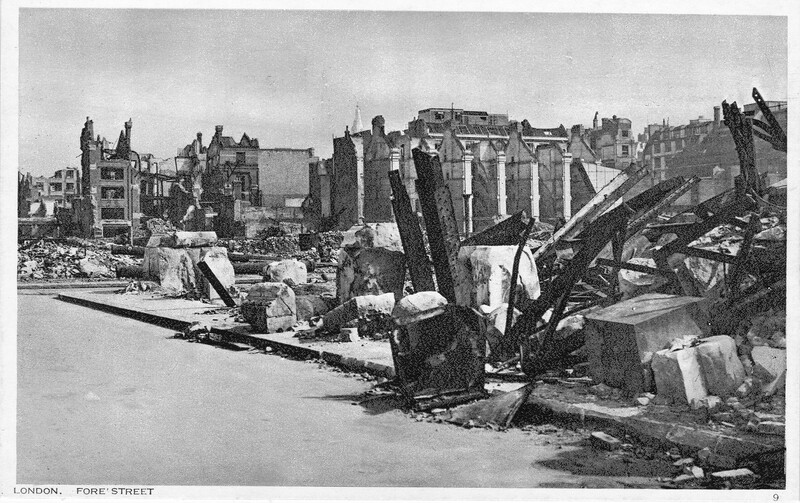 There is a single building in this wartime view that remains to this day. The building is the one in the centre of the photos above and below. I could not get the same angle as the original photo as the photographer must have been standing on the ruins of buildings between High Holborn and Charterhouse Street so the original photo is looking onto the side of the building which in my photo is off to the right. The final photo is of Temple Church, closed during my walk around London. It would be interesting to know how many of these postcards were posted. 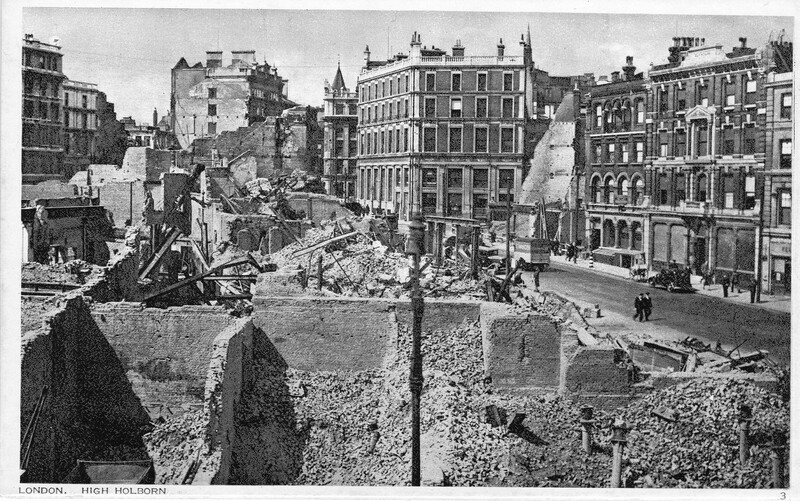 I suspect the majority were purchased and kept as a record of the destruction of the City rather than for posting. 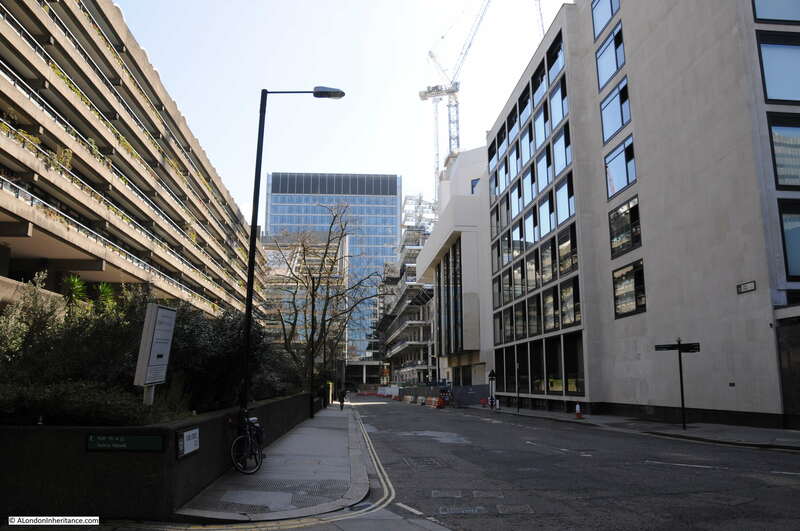 They provide a fascinating view of the city at a point in time, before the start of the post war redevelopment that in many areas such as the Barbican and Paternoster Square, would result in so much change. 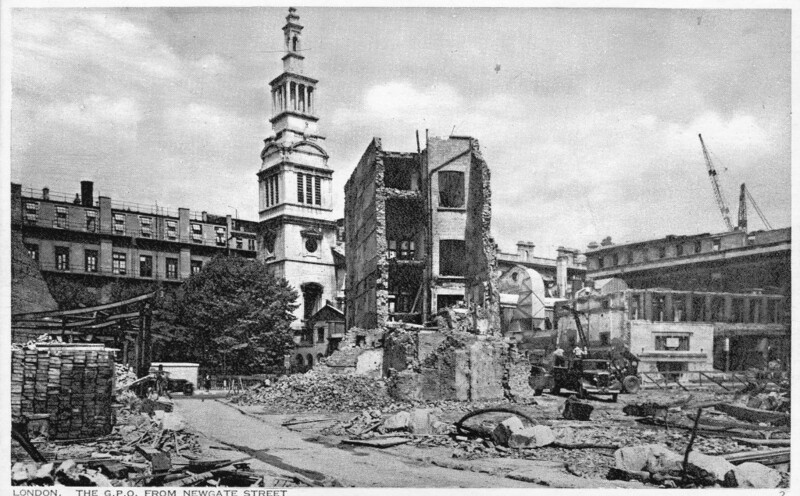 This entry was posted in The Bombed City and tagged Fore Street, High Holborn, London under fire, St. Paul's Cathedral on April 10, 2016 by admin.